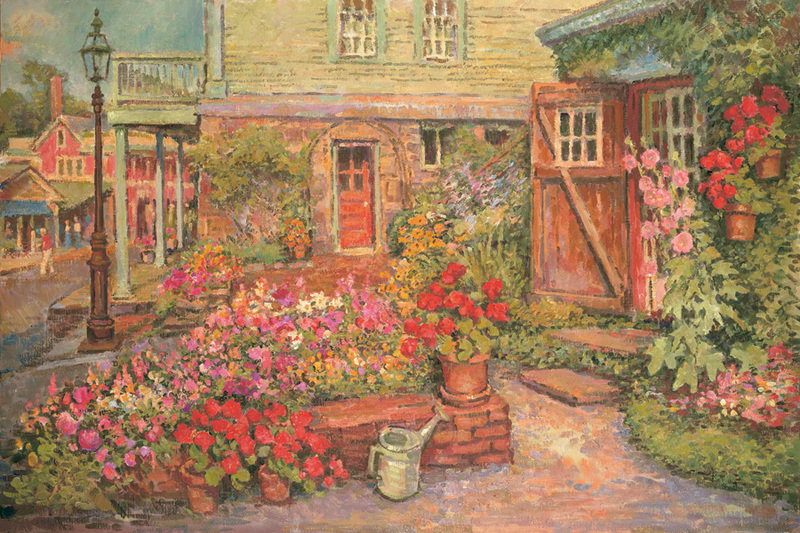 An original oil painting of the artists garden with black eyed susans and geraniums by Leif Nilsson. Please click on any of the thumbnail images to enlarge them. This colorful oil painting on linen canvas measures 36 x 54 inches unframed and 41 x 59 inches when surrounded by a handmade metal leafed finished corner cassetta style frame. Both the painting and the frame were made by Connecticut Impression Artist Leif Nilsson in his studio located in the village of Chester, Connecticut. The view is of his studio with blackeyed susans and hollyhocks in full bloom. The geraniums in the pots add a splash of pure red to the otherwise subtle yet brilliant hues of a New England summer cottage style cutting garden. Profusly growing in the flower boxes are a variety of rocket snapdragons and cosmos. Note the watering can, it shows up in many of Nilsson's garden compositions. The building on the right hand side of the painting is in fact Leif Nilsson's studio and the building in the middle background is his gallery. Across the way are other local buildings in Chester, such as the Pattaconk 1850 Bar and Grille, a favorite gathering place for Chester artists to meet each other for a meal or a drink or both and discuss their latest work. Click the thumbnail images above for more detail images of this painting or click here for more garden paintings by Leif Nilsson. Signed limited edition of 250 fine art prints, from an original oil painting 36 x 54 inches by Leif Nilsson. Image size unframed, 36 x 54 inches and 14 x 18 inches.